Year 2010 had been good to almost all investment classes. 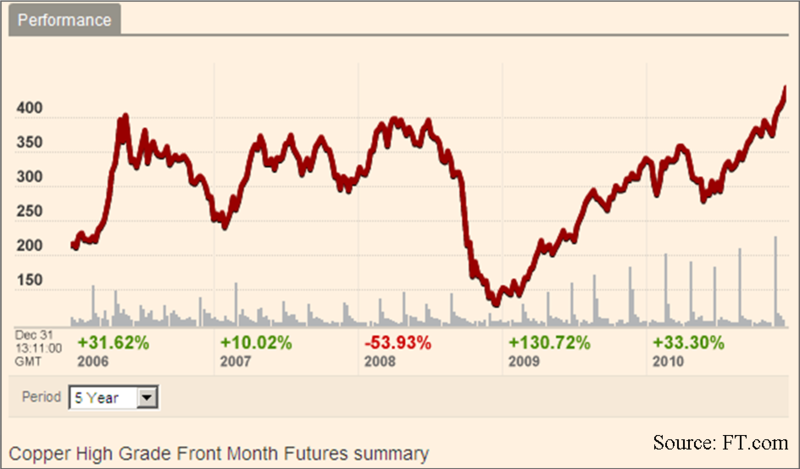 Stocks, bonds, commodities, and dollar are all moving higher in tandem, a first of such unison since 2005. Among them, commodity is the one leading the pack partly on dollar weakness, as well as propped up by world’s central banks quantitative easing. 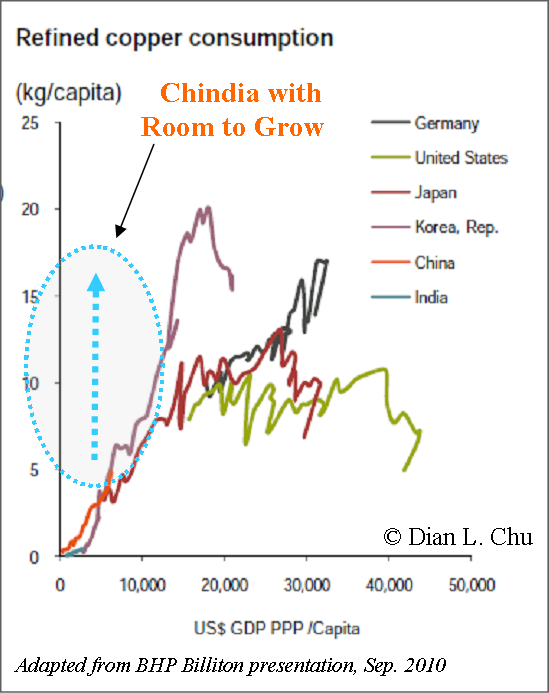 Base metals, in particular, are further supported as China keeps on trucking with double-digit growth despite most of the world practically stood still during the worst global recession since World War II. If you think Gold’s 30% gain last year is impressive, one base metal–Copper–even outshined the precious metal by rallying 33% on the year, and reached an all-time record in London, New York, and a 3-1/2 year high in Shanghai. Copper futures for March delivery on the Comex in New York stood at $4.4470 a pound at year-end, a record settlement. Nonetheless, compared to Gold relatively steady ascend, Copper prices have been on a roller coaster ride in the past few years, dropping almost 54% in 2008 amid global financial crisis, before staging a 130% comeback in 2009, and +33% in 2010 (See Chart Above). China is the world’s single largest buyer of copper. As such, copper prices typically rise and fall on any news coming out of China. However, this time around, particularly in the second half of 2010, markets did not even blink in the face of a Christmas interest rate hike and other tightening measures already implemented by China. Before anybody declares Copper the Untouchable, I’d like to point out that a lood at the CFTC Commitment of Traders report quickly reveals that in November, commercial participants, who accounted for 54.4% of copper futures open interest, held net short positions. This suggests some institutional players probably called the top of the market too soon, which is not that far off given the prior highs reached in pre-crisis 2008. But as I noted my analysis of gold and euro, the global excess liquidity is distorting almost all signals thus making trend analysis quite challenging. And the force majeure declared by Chile’s Collahuasi Mine around Dec. 20 only compounded the short squeeze, as Collahuasi is world’s 3rd largest copper mine accounting for about 3% of annual world supply. So, that means the 14% jump in December month was largely a short covering rally. Now, looking ahead into 2011, the price direction of copper will likely still hinge on supply, and mostly China demand, but it also depends on a couple of new market factors emerged just within the last year or so. On the fundamental side, the red base metal is seen as an economic barometer since it is mainly used in building construction and electronics accounting for about 50% and 21% of the copper usage respectively in the United States. Transportation equipment (11%), consumer and general products (10%), and industrial machinery and equipment (8%) are the other major industrial usage sectors, according to the USGS. 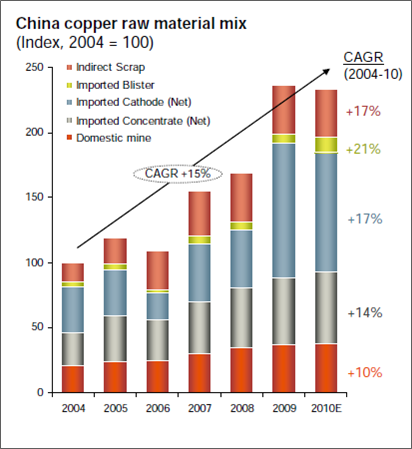 Fortunately, unlike rare earth metals, whose supply is single-sourced to China, Copper has a more diversified supply base. 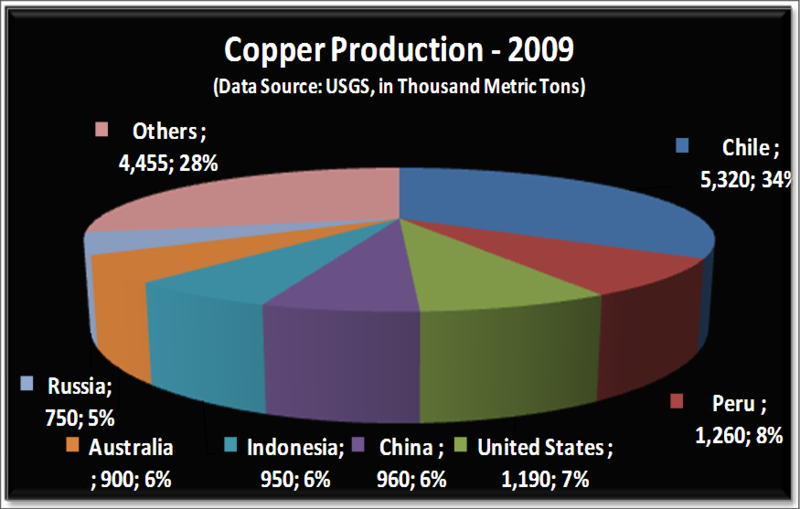 Chile, Peru and the U.S. account for around 50% of world’s copper production with Chile supplying over one third of world’s copper demand (See Chart). The bad news is that similar to crude oil and many other natural resources, existing copper deposits are getting exhausted, ore grades are declining, and new finds are far and few in between to make up for the depletion (See Chart Below). Many analysts are forecasting a supply shortage in 2011 as the global economic recovery ramps up. Although estimates vary, the expected supply shortfall in 2011 ranges from 380,000 metric tons by BMO to Barclay’s 825,000 metric ton. Even though global economy has improved significantly since financial crisis, producers have admitted that demand is still not quite back to pre-crisis 2008 levels. So, many of these forecasts are largely based on the expectation that China demand growth will remain healthy. While most copper bulls are pointing to China’s refined copper imports was up 37% month over month in Nov, which was the first in three months, according to Reuters, the year to date figure was a fairly modest 5% year-over-year growth, a far cry from the 25% growth in 2009. 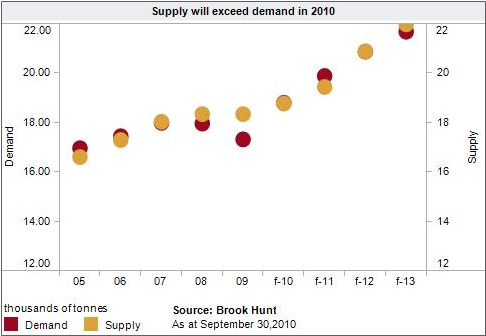 Even producer BHP Billiton was expecting a decline in Chinese demand in 2010 (See Chart Below). Moreover, as Beijing is gearing up for more tightening and restrictions, particularly on the real estate and auto sectors, to fight off inflation, asset bubbles and traffic congestion, I expect Chinese copper consumption may actually decrease by 8% to 10% in next year or two. Some analysts cited declining stocks level as another bullish indication. 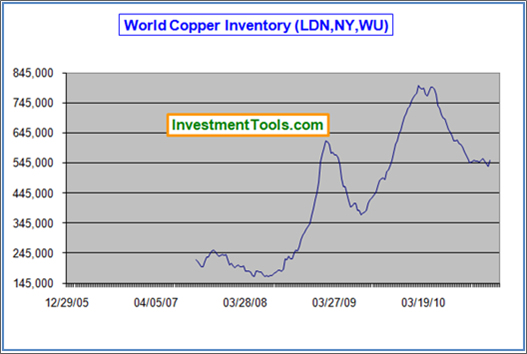 But recent data show LME copper inventories rose to a 3-month high (See Inventory Chart), and bear in mind that China is widely believed to have huge stock piles of unreported government and industry inventories. Furthermore, I think most people may have underestimated the possibility that China would use its purchasing power and stock piles to “level the copper playing field”, so to speak, as China typically does not like to come in at the near top of the market. Another often cited bullish factor for copper is that a strengthening Chinese Yuan will spur more imports by the world’s largest consumer. Currency valuation, although is one factor likely to affect buying behavior, it is unlikely to outweigh the other more powerful drivers such as real demand, and arbitrage opportunities. And if anything, copper, like most commodities priced in dollar, is most sensitive to the dollar movement instead of Yuan. With most of the shorts blown out by the Collahuasi Mine’s force majeure, copper markets are now predominately long. In addition to the entire country of China being long Copper probably for the next decade or more, prices are expected to receive further support from the new exchange-traded funds (ETF) backed by physical copper. ETF Securities launched an ETF on Dec. 10, and J.P. Morgan Chase & Co. and BlackRock are also looking to launch copper ETFs. Meanwhile, media reports citing data from London Metal Exchange (LME) said one trader (rumored to be JPMorgan Chase & Co.) currently holds 80-90% of the 377,550 metric tons of copper stored in LME approved warehouses, valued at around $3.5 billion. I would not be surprised if this one trader is acting on behalf of an ETF or investment bank. But on the flip side, this also means ETFs could do to Copper as SPDR Gold Trust (GLD) has done for the Gold market—increase investments and fund inflows. This, coupled with increasing investors demand as a hedge against currency and inflation, will likely put in a new and higher floor for copper, probably in the $3 a pound range, give or take 20 cents. However, I think Copper’s 55% price jump since July is a clear indication that a robust demand trend (from China or elsewhere) is already priced in…and then some. So, it looks like the copper market is getting ahead of itself, which indicates limited upside and more downside risks in the New Year. Just like $100 a barrel is a psychological barrier for crude oil that would drive changes in demand pattern, $5.00 a pound would be that same barrier for Copper. On that note and in combination of what we’ve discussed so far, Copper would be hard-pressed to top $5.00 / lb in 2011. However, I must say there’s is a possibility that copper could go to $5.50 as investors consider copper as the third reserve currency behind dollar and gold, since silver is much more volatile. I think copper most likley will see a correction in the first quarter with some profit taking after the New Year, followed by some buying on the dip. Then, there would be a pullback in summer followed by a run-up towards the end of 2011. Overall, Copper should have major support at $3.80, $3.50, and $3.20. A break below $3.20 would be an extremely bearish indicator. On the upside, $4.75 and $5.00 should be the next two resistance levels. If crude is to take the escalator up, but the elevator down, expect copper to take the stairs up, and the freight elevator down, if anything goes wrong in China. Source: Dian Chu, Economic Forecasts and Opinions, January 2, 2011.